On December 16, 1919 the first meeting was held of the Roy S. Hickman Post #78 of the American Legion. Their charter was officially received from the South Dakota department headquarters on August 20, 1920. The post receives it's name from Roy S. Hickman, son of Mr. and Mrs. Samuel Hickman, the first Leola serviceman killed on the battlefield of France, on July 17, 1918. The post had several meeting places before marking the present Legion Hall their permanent headquarters. The first meeting was held in the basement of the Bank of Leola. Other meetings were held in the old Blanchard garage, the Farmer Room in the courthouse and in the old jailhouse. Several attempts had been made to construct a permanent Legion Hall in Leola. 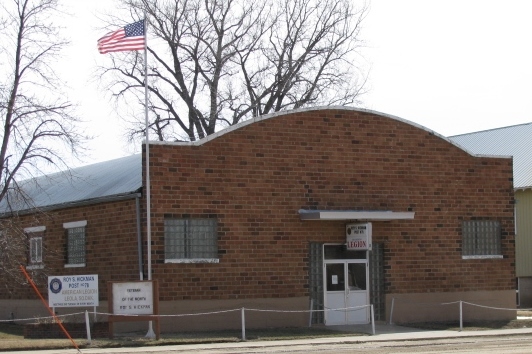 Finally, on June 15, 1948, plans were formulated for the Leola American Legion Building. The first meeting was held in the new hall on October 11, 1949. In 1959 the Leola American Legion acquired a license from the city of Leola, and designed, built and in the fall opened the L & L Bar. The profits from this business help the Legion to support and contribute to various community activities such as; the summer baseball program.